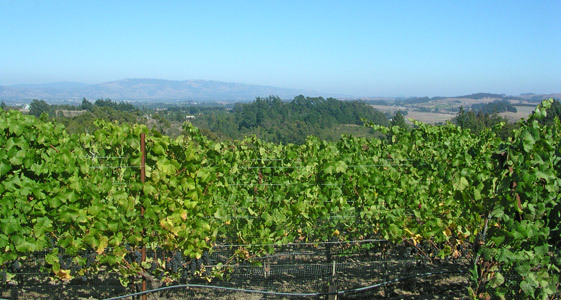 Sitting southwest of Sebastopol on the northern edge of the Petaluma Gap, Thorn Ridge vineyard, planted in 1995, is a magnet for cold air and fog, just the right elements for superb Pinot noir grapes. With panoramic views of northern California's Coast Range, Thorn Ridge is an ideal spot for a picnic on a warm summer day, however, with a weather pattern that runs in 3-5 day cycles of alternating hot and cold, this great spot for an outing becomes downright inhospitable during the cold portion of the cycle. Situated seven miles from the cold Pacific Ocean, the soils are low-vigor silt and the vineyard receives so little irrigation that it is for all intents and purposes dry-farmed. 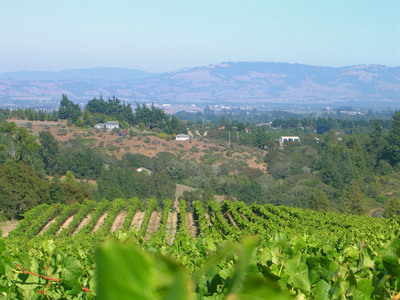 This area is known by the locals as “Sebastopol Hills” and is becoming known as a superb area for Pinot noir. 2001 was the first vintage of Talisman Thorn Ridge vineyard Pinot Noir, and in fact the first vineyard designated Pinot from this vineyard. Now a few other Thorn Ridge Pinots are finding their way into the marketplace to great acclaim.